"Lazy Days" is the title of this months newsletter, but I am sure you have been busy cardmaking throughout the year so far. I have been un-productive for most of the month of June, due to a very sad bereavment in the family. My mum-in-law died on the 14th, after a long illness, and it sort of knocks you sideways. But I will get myself together and back on track in the coming months. This Cream Carton is one of the pages added to the website. It can be used as a favour box, to add jewellery to, as a gift, or just to put confetti in for a wedding. 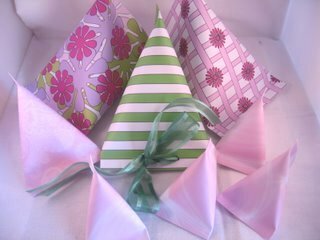 Make the colours suit your use, and it's easy enough to make lots of them for a kids party. One of the things I promised in the last newsletter was the backing papers I have been making. Well here they are, they are my first attempt and I know they are simple but they are yours to try out. Let me know if you liked them, and also what else you would like to have....I will do my best to fulfill your requests but it may take some time, as I am still learning, and it's a steep curve! You don't need a password to access these and they are in PDF format so should be OK for any computer. is the link to the stripes, and you will find some ideas of how I have used them on this page. 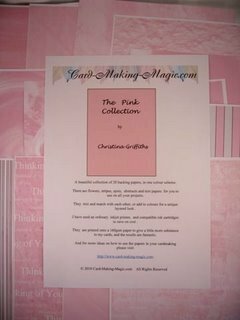 There is also a link on that page for yet more free papers, and these I have named "The Pink Collection"......guess why? Yep!! they are all pink. Love 'em, my favourite colour. I hope you will give them a try and let me know what you think. As always thank you to all of you that email me all your news. I really am getting to know some of you, through the chatty contact that we have, and it is lovely to get them, so please keep them coming.